In a new report on India’s labour market, the McKinsey Global Institute has focused on the concept of “gainful employment", basically better work (or jobs) for India’s 460 million workforce that promise more money. 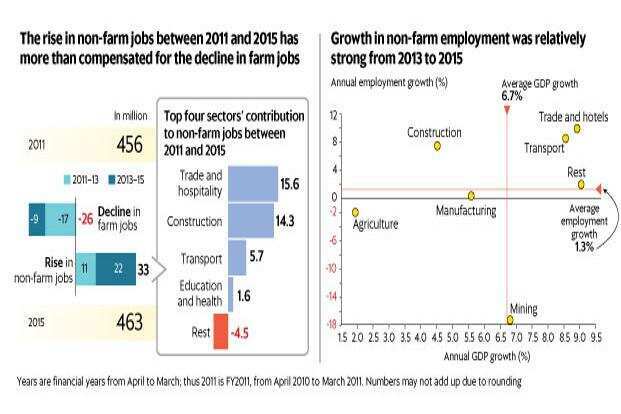 While repeatedly stressing the need for better, and more current jobs data in India, the report, titled India’s Labour Market: A new emphasis on gainful employment, highlights the structural shift from agriculture to the non-farm sector. Between 2011 and 2015, the number of agricultural jobs reduced by 26 million while the number of non-farm ones rose 33 million. This was especially driven by creation of jobs between 2013 and 2015. More current data isn’t available. Despite the growth in non-farm employment, because of the sheer number of people entering the labour force, the overall labour force participation rate fell from 55.5% in 2011 to 52.4% in 2015. For men in urban areas, the corresponding numbers were 73.7% and 69.1%, highlighting the challenge at hand. It’s a challenge that isn’t really captured by data because of some structural changes, the report adds. For instance, says the report, “declining labour force participation need not indicate a slowing growth in gainful employment" because more people could have stayed in the education system longer and fewer women may need to work because their families are now better off and do not need them to. Then, measuring both “employment" and gainful employment becomes tough in a country where 86% of the labour force is employed by the so-called informal sector. Nor do existing job surveys capture “economic and social mobility" which might give some indication on gainful employment, and “underlying labour market shifts" because Indian farm workers move “seamlessly" from farm-jobs to non-farm jobs at certain times of the year. Still, the report concludes, the shift away from agricultural jobs itself is a move towards gainful employment. According to the McKinsey Global Institute report, the so-called gig economy (or increase in independent work opportunities available), government spending and the consequent creation of jobs, and increased entrepreneurial activity have created gainful employment for between 20 million and 26 million people between 2014 and 2017, the report says. Of this, increased spending by the government alone has resulted in 2 million new jobs. Automation is unlikely to immediately affect jobs in India, the report says, although it puts the overall share of activities that can be automated at 52%, not very different from the global average. In most parts of the world, automation could take up to two decades, and it could take longer in India, given the low level of wages and the cost of automation. Even in IT, the report says, while some traditional roles may be automated entirely, automation will itself create a new set of jobs in “fields such as cybersecurity, mobile app development, new user interfaces, social media, data science, and platform engineering". These jobs will require new skills though, and may require existing employees to be retrained, the report points out. In conclusion, the McKinsey Global Institute report suggests three ways to create opportunities for more gainful employment. These are “more appropriate statistical measurement of employment", “targeted government programmes", and “removing hurdles that stand in the way of investment and innovation." For instance, it adds, building industrial townships, focusing on manufacturing, and the development of tourist circuits, all through government programmes, could create more opportunities for gainful employment.